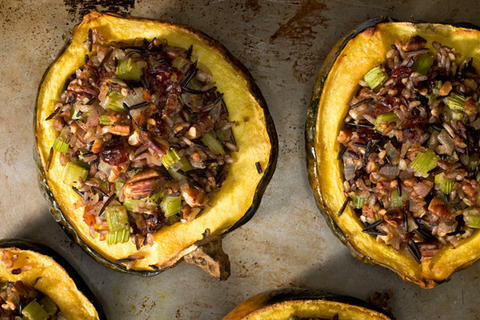 Acorn squash is a satisfying side when roasted and topped with a pat of butter and a drizzle of maple syrup, but filled with a hearty stuffing of wild rice, pecans, and cranberries, it’s a meal in itself. 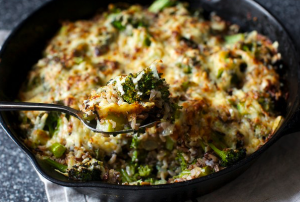 Loaded with comforting flavors, this vegetarian dish brings fall home, but it can be made any time of year. 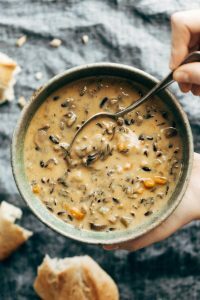 The wild rice mixture can be made up to 2 days ahead; keep it refrigerated in an airtight container. You can make the stuffing up to 6 hours ahead; keep it covered in the refrigerator. NOTE: The squash baking was a bit fiddly. I will bake it differently next time as in cut side down for 30 min or so, then turn and bake until almost tender, put in stuffing and finish baking. Place the rice, chicken stock, 1 1/4 cups water, 1 tablespoon butter, and 1 teaspoon salt in a medium saucepan and bring to a boil over medium heat. Cover the pot and lower the heat to simmer ( she pulls the pan halfway off the burner) and cook for about 1 hour, until the rice is tender and the grains begin to burst open. Stir the rice occasionally while it’s cooking, scraping the bottom of the pan to prevent it from sticking. Turn off the heat, and allow the rice to steam for about 5 minutes. Stir the remaining tablespoon of butter into the rice, then add the grapes, scallions, pecans, orange zest, orange juice, 1 teaspoon salt and the pepper and toss. Taste for seasonings and serve hot.